More details on some of the species of submerged and floating aquarium plants that I have kept/tried. 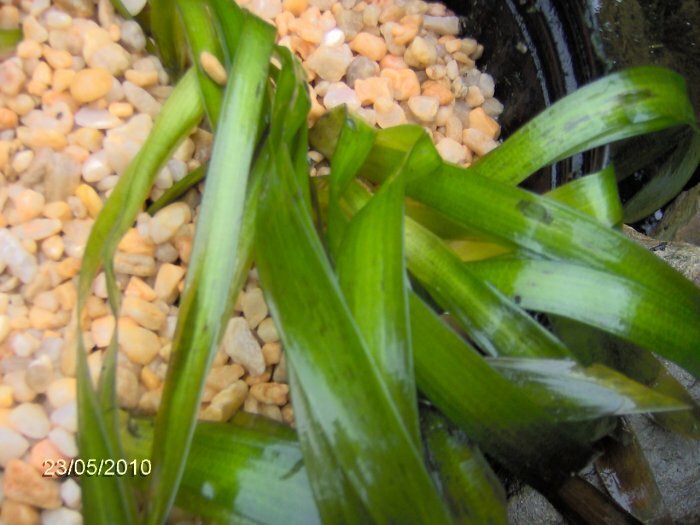 See the submerged plant page for more on submerged plants. That page is geared towards pond submerged plants but often the same plants are kept in aquariums. Java moss, or Vesicularia dubyana , is a wonderful plant to have if your tank includes small egg-laying fish. This plant will grow in a clump on the bottom of the tank, among other plants, or attached to driftwood. Sometimes, it will become unruly. In that case, I attach it to a suction clip commonly sold to hold vegetables for herbivorous fish. I attach this to the glass or bury it in the gravel. Java moss is great in that it does not require strong lighting. It will grow in tanks with a single standard fluorescent tube even. I have double Triton tubes, and it grows well there too. The biggest problem I had with Java moss was trying to keep hair algae from growing on it. I had to throw out some Java moss to try to get the hair algae out. That problem went away after I added rosy barbs to the tank. Few fish will eat Java moss (except my former goldfish). Small egg-laying fish, such as my white cloud mountain minnows and zebra danios, use the Java moss as their preferred location to spawn. Most tetras will also use Java moss in which to spawn. The fish are padded by the moss so they are not as likely to be injured. Some eggs fall into the moss and are protected from hungry fish. Newborn fry can hide in the moss. For information on breeding, see my breeding and fry care page. Java fern, Microsorium pteropus , is known for its ability to tolerate low light levels and for not being eaten by many fish. While it is not supposed to taste good, no one told my goldfish who ate the plant I put in with them years ago. Most other fish leave it alone. Java fern is a fern that will produce spores and often baby plants right on the leaf. This plant does okay in my tanks with moderate light, soft water, and temperatures in the low 70's. It is very slow growing. Leaves can grow pretty large but then tend to rot and die, often with "babies" growing on them at that point. The small ramshorn snails in my tanks seem to enjoy "chewing" on it but the plant seems only minorly affected. I have Anubias nana and Anubias barteri . One of my A. nana is many years old. I have found these plants to be very slow growing, tolerant of my setup (with moderate lighting, no carbon dioxide injection, soft water, temperatures in the low 70's degrees F), and virtually indestructible. At times when all other plants were falling apart, the Anubias were unaffected. They are strong plants with thick leaves. The only problem I have ever had is sometimes too much algae grows on a leaf, and the leaf can die. In tanks with a small bristlenose plectostomus or otocinclus, the plants have been kept reasonably clear of algae accumulation. Anubias are also one of the few plants that I can treat in a dilute bleach solution (to kill snails and algae) without worry about killing the plant. Anubius in my 50 gallon tank on 5/19/10. I am not sure; they may be crypts. They have been there so long that I forget! Onion plants, Crinum thaianum , have an onion-like bulb with thick green leaves coming out the top. 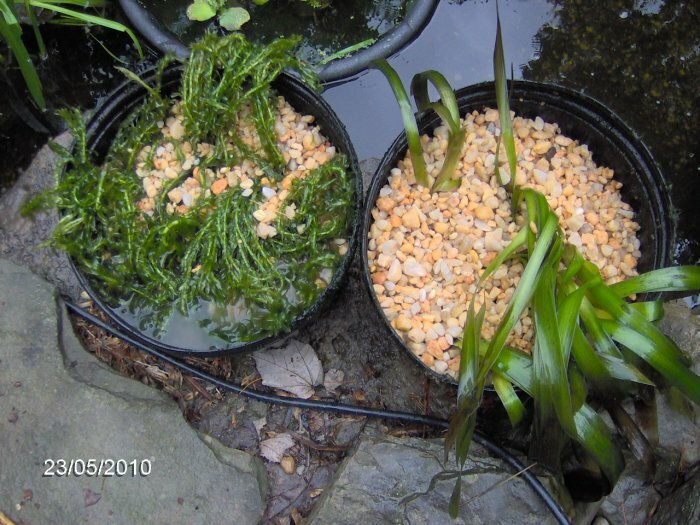 I have tried a number of these plants with goldfish and my foot-long plecostomus to find a plant that can survive them. While the fish did not eat much of the onion plant, they did uproot them over and over so that the plant never developed roots to hold itself in place. I had one large onion plant in my 40 gallon tank with the plecostomus that I added some lead weights to to keep the plant in place. Every day, the pleco knocked it over, and I uprighted it until it died! My 50 gallon tank contained a miniature onion plant that was doing okay but not great (did not survive either). Onion plants seem to be able to tolerate a lot of abuse but even so, some have died in my tanks. As of 3/7/06, I have a few in my 20 gallon tank. Crypts, Cryptocoryne , can live in lower light levels. They are slow growing and pretty hardy. I have a number of them in my tanks of various species. They seem resistant to most of the problems that befall my other plants. 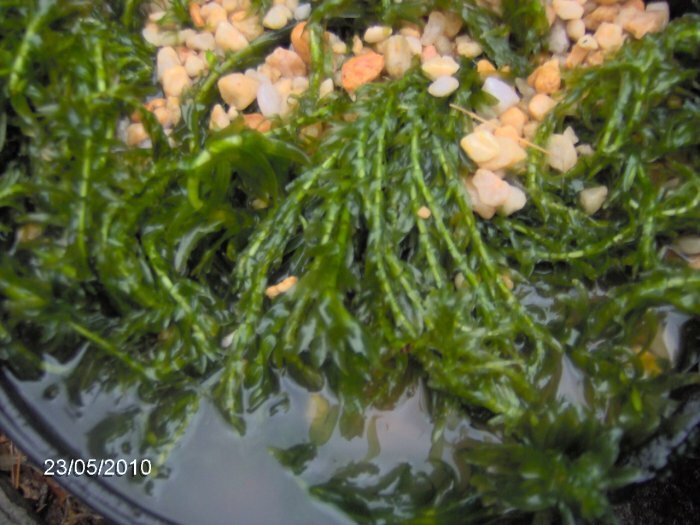 Anacharis is the most common submerged plant used in ponds in the USA. It is also often used in aquariums. In my tanks, it does not survive long because the lighting is not strong enough, and I do not have carbon dioxide injection. This plant of whorls is fast growing and uses a lot of light, carbon dioxide, and fertilizer. When I put it in goldfish tanks in the past, it was immediately eaten. Any fish that likes to eat plants will love to eat anacharis. I have some more information on anacharis on my submerged pond plants page. Hornwort, Ceratophyllum demersum , is another common pond plant. In ponds is grows well and tends to float all around. It rarely stays anchored in place. The same thing happens in aquariums. In my tanks, hornwort grows slowly and floats around. It never thrives probably due to not enough light and carbon dioxide. Nonetheless, it did survive for quite a while. Hornwort - I took out a wad for a photo op on land (just for a second) on 7/4/10. Italian valisneria grew like a weed in my 40 and 50 gallon tanks for many years (eventually died). This may be because it is capable of getting carbon dioxide (CO2) from carbonates (HCO3-) in the water. My water is super soft though and has almost no carbonates so I do not understand why this would make a difference in my case. Vals grow from the bottom of the tank to the top of the water and then keep growing out horizontally. They are a light green and provide lots of obstacles/hiding places for fish. Valisneria is said to be a favorite for angelfish. Jungle val is a larger type often used in ponds. In my ponds, the fish eat it all. Vals grow by runners and can be separated as they spread. They have roots but they are not very strong as my fish tended to uproot them often. For some reason, the only fast growing plant besides Italian val that used to survive in my aquariums long-term was Rotala indica . This plant has small leaves with a pink tint although some are mostly green. They grow to the tank surface and then grow horizontally. 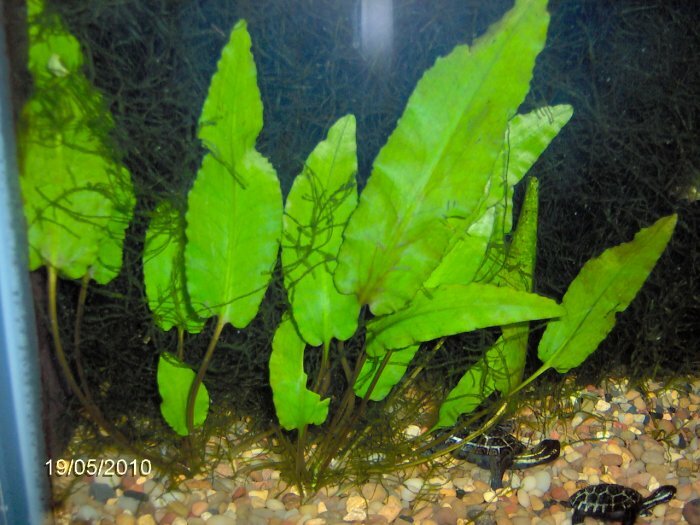 I love this plant as it thrived in my 50 gallon tank providing lots of comfort (hiding places) to the fish for many years (while updating this on 3/7/06, I cannot think of when the plant died but it is gone). It is a good rooter and also can take the tons of tiny ramshorn snails and hair algae in the tank. Floating fern, Ceratopteris cornuta , is a plant that I ended up with a long time ago. It is still alive and growing like a weed in my 20 gallon tank. [Even as I update this on 3/7/06 after many years, it indeed is still going strong unlike most of the other plants on this page that did not make it.] This fern grows large and tends to cover the entire surface. The fronds grow out of the water and towards the light when space runs out. Baby ferns grow off the leaves of a larger fern. Floating watersprite, Ceratopteris pteridioides looks similar. When I have seen floating watersprite in person, it does not look like my plant at all but it does in the Baensch atlas. Floating fern in my 20 gallon tank on 5/19/10. 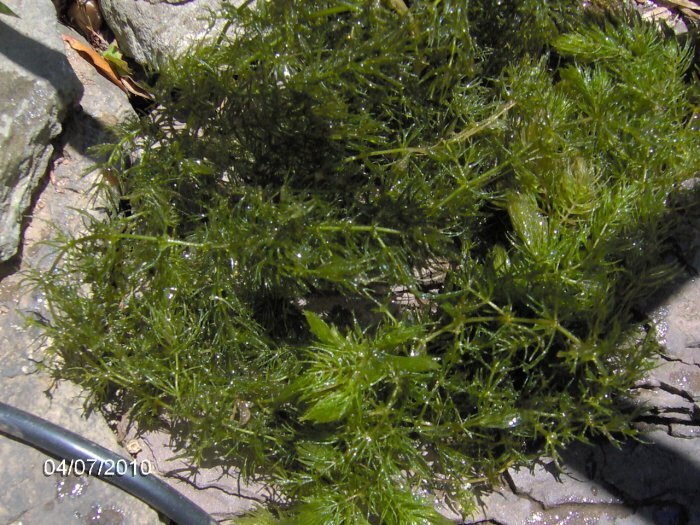 Ambulias = Limnophila = a soft green plant with very thin leaves; can be hard to maintain. Foxtails = Myriophyllum scabratum = soft green or red plants; can be hard to maintain; used in ponds sometimes. Bacopas = Bacopa = plant with small waxy leaves; can be hard to maintain; used in ponds sometimes. Cabombas = Cabomba = soft dark green plant; stronger than ambulias or foxtails; often used in ponds; green cabomba = Cabomba caroliniana and red cabomba = Cabomba piauhyensis . 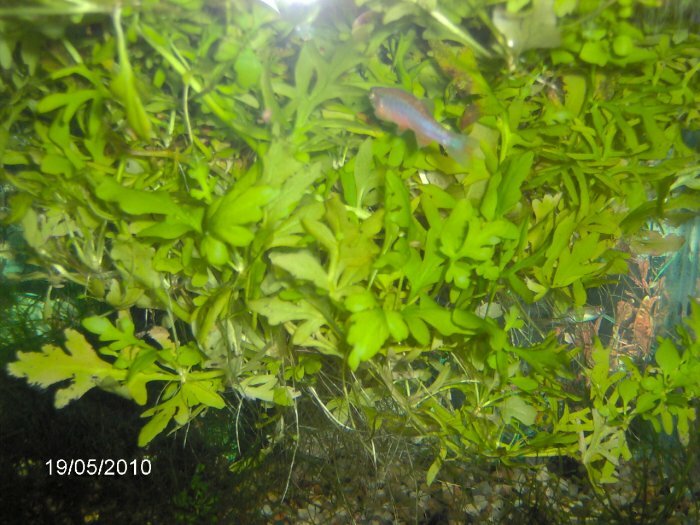 Hygrophilas = Hygrophila = commonly sold plant with somewhat large leaves; leaves tend to fall off in my tanks. Water wisteria = Hygrophila difformis = large fancy green leaves; said to be an easy plant but I cannot keep it alive. Ludwigias = Ludwigia . 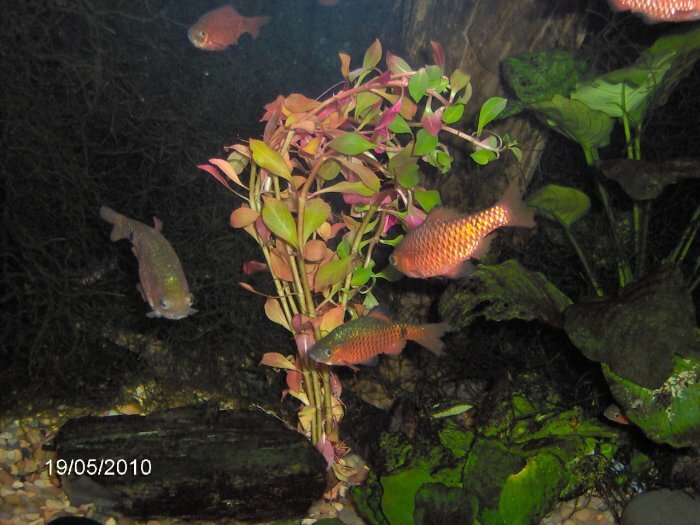 Here is a photo of ludwigia in my 50 gallon tank on 5/19/10. Rotalas = Rotala = one of my favorite group of plants because I can keep them alive. Hairgrass = Eleocharis parvula = small plant that grows on the bottom and looks like grass. Dwarf sagittaria = Sagittaria subulata = small plant that grows on the bottom and looks like a sparse grass; grows okay in my tanks for a while; I like this plant. Banana plant = Nymphoides aquatica = plant with a bunch of "bananas" which are tubers and a few leaves; often sold for goldfish tanks but can be hard to keep alive; in the water lily family. Amazon swords = Echinodorus amazonicus = very large plant with large leaves often sold; requires intense light, carbon dioxide, and fertilizer. Wind & Weather sells neat things for your garden! Go to the main plant page (full index). Go to the aquarium algae index. Go to the pond algae index. Go to the aquarium plant index. Go to the pond plant index. See the master index for the plant pages (quick index).